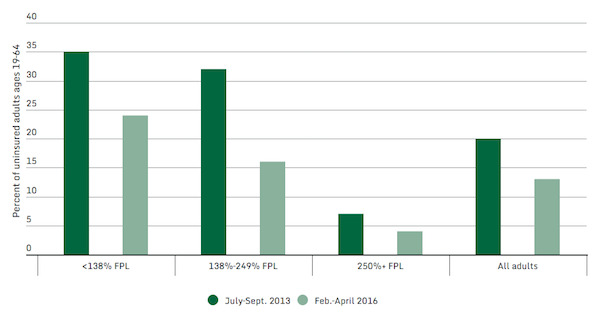 Notes: FPL refers to federal poverty level. 138% of the poverty level is $16,243 for an individual or $33,465 for a family of four. 250% of the poverty level is $29,425 for an individual or $60,625 for a family of four. Data Source: The Commonwealth Fund Affordable Care Act Tracking Surveys, July–Sept. 2013 and February–April 2016. Source: The Commonwealth Fund: Who Are the Remaining Uninsured and Why Haven’t They Signed Up for Coverage? This entry was posted in Data Watch on August 24, 2016 by Genevra Pittman.